Last summer I went on a field trip. I attended a three-day seminar on Christian-Jewish relations. This happened at the Sacred Heart University in Bridgeport, Connecticut. I arrived on Monday, checked into my dormitory on campus, and we all enjoyed kosher cuisine with other divinity and rabbinical students as we kibitzed about what Jews and Christians have in common. What do we share? Quite a lot. To begin, we believe in one God. We enjoy a shared vision of reality, a belief in the loving, creating Intelligence that has offered us salvation from the depravity of sin by faith that what he has spoken to us through the prophets is trustworthy and true. Our shared faith is based in our personal knowledge of God. For Christians, faith is personal knowledge of God as disclosed by Jesus Christ. That’s where Jews and Christians departed long ago when we reached that fork in the road and chose divergent paths on our journeys toward that shared reality of the God of our Fathers. Even so, we don’t have to walk that path entirely apart from one another. God speaks with one voice to humanity. As Christians we must remember that the life, death, and resurrection of Jesus did not nullify the covenant God formed with his chosen people, the Israelites. Judaism didn’t end when Jesus was born; the Jews didn’t “drop the ball” or “miss the boat” because many of them chose not to believe in a Crucified Savior. In fact, the Catholic Church supports and believes in Judaism as a thriving, vital monotheistic religion. While it is true that Jerusalem did not accept God’s moment in history when he offered it, the Church rejects nothing of what is holy and true in Judaism. Jesus was a Jew and to deny him would be to deny the truth. What kind of faith would that be? The truths contained in the religion of the People of the Book—the religion which Jesus, Mary, and Paul practiced—reflect a splendid ray of truth that enlightens the soul of humanity (Nostra Aetate No. 4). Saint Paul grapples with this big question in his Epistle to the Romans. Why did the nation of Israel as a whole reject Jesus? Such was a source of heartbreak for Paul, called as he was to bring together in love all that sin had driven apart. Christ commanded Paul to preach the gospel to gentiles, kings, and Israelites. With the Greeks Paul was largely successful and kings like Agrippa and even Aretas in Arabia gave him a fair hearing. By and large, however, Paul’s own people refused to accept his message. In confronting this dilemma he draws up a chain of reasons as he seeks to understand what happened. Why didn’t they believe? God prepared the world to receive the Messiah by forming the Jewish people through a covenant that set them apart from humanity and made them the gate of heaven through which he entered into history — salvation came from the Jews (John 4:22b). Yet when Jesus was born he caused many to react with revilement, rejection, and fear, rather than to accept his joyful message of love and hope and joy in the resurrection. He became a sign of contradiction. I know a lot of people that do not believe that Jesus is the Son of God. No matter how hard I pray and try to get them to understand, their hearts remain immutable and they refuse to accept even the truth that I in fact do believe. What’s the point? they say. Nothing ever changes. Look at all the evil in the world perpetrated in the name of religion. Becoming a priest cost me some friendships and many family members remain largely unimpressed with anybody who chooses to pursue what they considered to be a ‘myth’ about a God-Man who rose from the dead and who promises to return in glory but never comes. To whom or to what are you praying? And what do you get? Another blank look from the sky. Welcome to Paul’s reality. He was as Jewish as Jesus and if anybody could and did boast of this privilege, it was Paul of Tarsus, a Greek-speaking Jew from the outlands of Jewry who moved comfortably among Gentiles and Jews alike (Philippians 3:4-6, 2 Corinthians 11:22-29). As the Scriptures testify, Jews of Paul’s day for the most part did not accept the gospel; on the contrary, many opposed its influence and its increase. “Even so, Paul maintains that the Jews remain very dear to God, for the sake of the patriarchs, since God does not take back the gifts he bestowed or the choice he made” (Nostra Aetate 4). Paul plainly writes: “They are Israelites; theirs the adoption, the glory, the covenants, the giving of the Law, the worship, and the promises, theirs the patriarchs, and from them according to the flesh is the Messiah” (Romans 9:4-5). That is Paul’s use of logic for what for him was an emotional issue, his own heritage. Through Israel the Lord entered into the covenant with humanity, first extended to Abraham, codified through Moses, affirmed by David. To the Jews God entrusted the Law and the sacred liturgy. He did this so that the people of God whom he planned to bless with his Son could be made holy and beloved, a royal priesthood, a holy nation, a people peculiarly his own. And so they were and so they continue to be today. Paul never stopped being Jewish even after he encountered the Risen One. His radical “conversion” was not a change in religion or even a turning away from sin. What Paul received from Jesus was a commission to evangelize the nations. In fact, Paul felt more Jewish after meeting Jesus outside Damascus than ever — he came to believe that the covenant between God and man had been fulfilled in Christ, whom he met face to face, like Moses who openly conversed with the Lord. God planned in the fullness of time to restore all things in Christ (Ephesians 1:10). 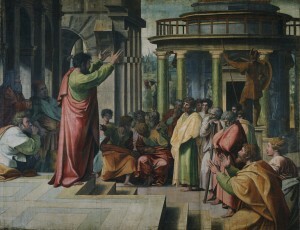 Of this Paul was convinced, that the “God of our fathers” had sent him to preach the gospel. Customarily, whenever he entered a city he went first to the “lost sheep of the house of Israel” in the synagogues on the Sabbath to teach that Jesus was the fulfillment of the Scriptures. Paul’s own recognition of Jesus as Lord and his baptism by Ananias in the Parphar River in Damascus meant that he accepted the truth about Israel but the recognition that his own people did not accept Jesus was for Paul a perpetual source of heartbreak. “I speak the truth in Christ, I do not lie; my conscience joins with the Holy Spirit in bearing me witness that I have great sorrow and constant anguish in my heart” (Romans 9:1-2). Yet Paul counseled Christians against being complacent, that they were not to boast about their salvation as something they obtained by themselves. Rather they were to cherish it and to share it for what it was: an unmerited gift from God. “There is no Jew nor Greek, no slave of free person, no male of female; you are all one in Christ Jesus” (Galatians 3:28). Many Jews did accept Jesus as the Messiah: Peter and the other Apostles, Mary, and countless disciples over the centuries. But overall, the Jews rejected Jesus. Why? Was God somehow unfaithful to his covenant? Did the chosen people feel abandoned by God? Could not he who created the heavens and the earth not have changed the minds and hearts of his people and help them to accept the truth? These questions dogged Paul for the rest of his days, even as he arrived in Rome in the mid-60s toward the end of his life (Acts 28:3). Paul knew, he believed, and he accepted the radical truth: that his people would not come to the same realization. He moved on. During the seminar I attended, we visited a synagogue near Fairfield University. I had never visited a synagogue before. I gazed with admiration at the ark behind the pulpit, which housed the Torah, the five books of Moses, selections of which are read on the Sabbath. A cantor intoned the verses in Hebrew. Next we took a bus to Saint Augustine Cathedral near downtown Bridgeport. I remember feeling great pride when I saw the expressions of the Jewish and non-Catholic students as they entered the nave. For many it was their first visit to a Catholic church. The rector gave us a tour and explained why Catholics cross themselves with holy water from the font in the vestibule and why we venerate the saints. Our worship practices are different, but we could still focus on shared aspects of our faiths. Paul’s message is this: salvation is not guaranteed, with or without the name recognition that comes from being the chosen people. No matter how hard we practice or preach or pray, we cannot take our faith for granted. It took Paul most of his career and missionary efforts to work up to writing Romans. It is easy to read in the tone of his prose that he never got over his sincere grief that the people of God — his people — by and large chose not to accept Jesus as their Savior. His words, “I have great sorrow and constant anguish,” bear witness to this cross he chose to carry. Our faith is ours to use or to lose, and it is ours to share. If we practice what we preach and believe in what we pray, then our belief — a gift to us from God bought and paid for by the sacrifice of Christ — will drive us to passionately care and work for the salvation of those we love. We could have no better example of this, or inspiration for our work, than St. Paul and his letter to the Romans.